Homemade Devil’s Food Cake Mix is quick and easy to make. Ditch the boxed mix and whip up this simple freezer-ready cake mix recipe. 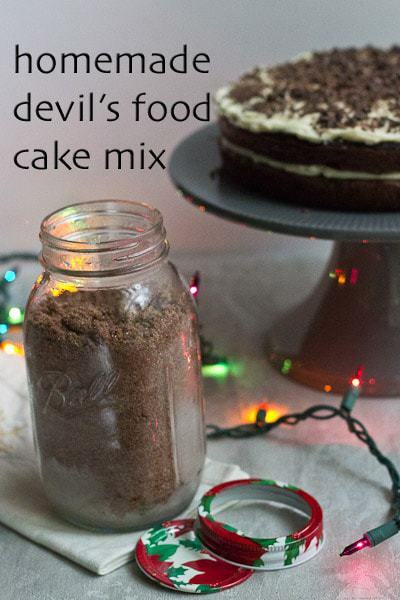 Read on to find out how to make and store Homemade Devil’s Food Cake Mix and learn how you can make it into some easy but delicious recipes. There’s a certain point in your baking life when you become ashamed to use a boxed cake mix. It’s not just about the possibly questionable ingredients that show up in shelf-stable mixes. Bakers as well as cooks strive to impress with our creations, from a simple yet flavorful salsa, to the most delicate and crumbly scone. Making something from a mix? Well, that’s just buying your way to praise. I don’t think this way all the time. After all, I have two kids, two diabetic cats (which take up a surprising amount of time for care), multiple freelance jobs, and a garden that is doing extremely well cultivating weeds and fire ant hills. But I still like cake. And I like cake more when it comes to me faster. Granted, cake doesn’t take that much time to mix up to begin with, but if you can make a shortcut, why not do it? This Homemade Devil’s Food Cake Mix is just as easy as running to the store to buy your favorite boxed mix. And because the recipe actually makes enough for two cake mixes, so you could say it’s really half as easy. To make it, just add all of the ingredients to the bowl of your food processor. Give them a good blitzing in the food processor and you’re done! Storing your Devil’s Food Cake Mix is just as easy as making it. Instead of setting aside room in the pantry, you need to set aside a little room in your freezer. Divide the cake mix into two airtight containers, with about 3 ½ cups of mix in each and freeze for up to two months. quart glass jar, but you can use a freezer-proof plastic bag. The jars are easy to dress up for gift-giving, however! When you’re ready to bake using Homemade Devils Food Cake Mix, just mix in eggs and water and you’ll look like a kitchen genius. 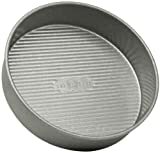 9-inch cake pans, you won’t really get the height many expect from layer cakes. I’ll let you in on a little secret — those box mixes don’t achieve lofty heights when made using the printed instructions. You need two boxes to make the cake shown on their packaging! This mix is the equivalent of two boxes, so if you want a tall cake, just use the entire batch. I enjoy using Devil’s Food Cake Mix in my Peppermint Mocha Cupcakes recipe. They’re the perfect easy seasonal cupcake recipe for all your holiday parties. You could also make my Black Forest Cake recipe quicker and easier by using this mix for the cake layers. Spend your time focusing on the cherry filling and frosting instead. No one would even guess that you started with a cake mix. If you’d like to top your Devil’s Food Cake or cupcakes with a simple chocolate frosting, try the frosting from Reese’s Peanut Butter Cake. In a large food processor, mix together dry ingredients until well-blended. Add butter and vanilla and pulse until mixture resembles coarse crumbs. 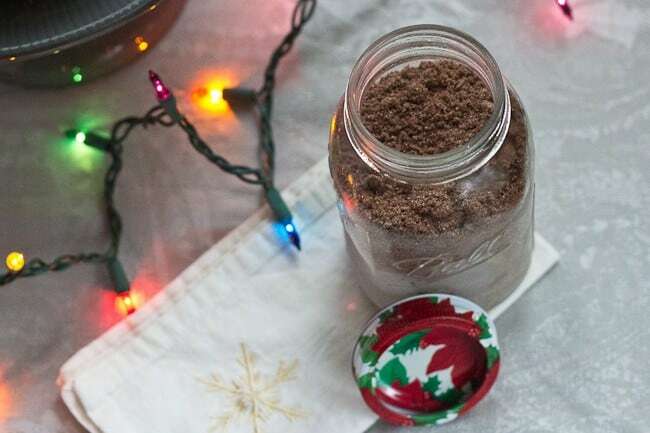 Divide mixture in half (about 3 1/2 cups) and pour into two large Mason jars or freezer bags. Store in the freezer for up to 2 months. Preheat oven to 350°F. 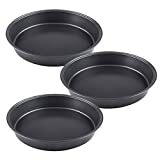 Grease two 8-inch cake pans and line the bottom with parchment paper. Beat mix, water, and eggs together until few lumps remain. Divide between cake pans. Bake for about 25 minutes, until a toothpick inserted in the center comes out clean. This is genius! I started a cake mix series on my site because it seems so many people love quick desserts. I can’t wait to try this! 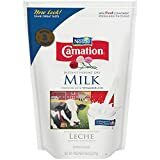 Any recipes for converting yellow cake mix to ingredients? Why instant coffee? It do not like coffee. Can I just leave the coffee out entirely what could I substitute it for? Please let me know by e-mailing me soon. Instant coffee enhances the chocolate. I put it in all my chocolate cake recipes and in chocolate puddings. The 1 jar makes 2 pans? So the whole amount made makes 4 pans? Im kinds lost in this! Sorry for the confusion Mayssam! Each jar is the equivalent of 1 box of cake mix. You’ll be able to make either TWO 8-inch or 6-inch layers, or ONE 9-inch layer, or about 18 cupcakes with each jar. The whole recipe makes 2 jars/2 box equivalents. Hello, thanks for posting this. Wondering if I leave out any oils/butter in recipes that call for devil’s food mix since you have already included butter in your mix? Thanks! Hi Laura, I do leave out the added oil due to the butter in this mix recipe – be sure to add the eggs, though!